and so much more. 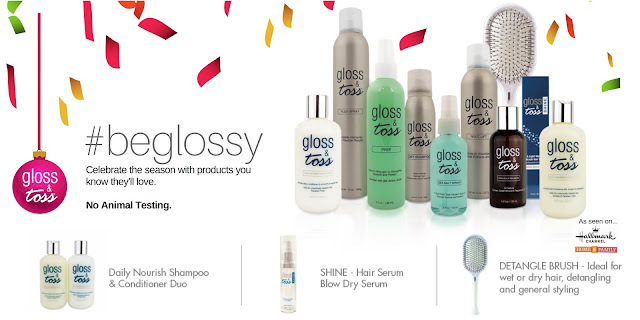 Detangling your hair has never been easier and much more comfortable than with the Detangle Brush from Gloss & Toss. Many brushes break down over time and are heavy and uncomfortable when detangling hair or brushing. This lightweight detangler was developed with you in mind and is not only an effective hair tool, it's quite pretty to look at we must say, and a must have for every beauty ritual. Want some top detangle tips? It goes without saying to start at the ends of your hair first. If you start at the scalp and try to brush through the matted or tangled pieces, you're just tightening the "knots" if you will and putting more pressure on the hair. Try separating hair with fingers first into as many divided sections as you can without pulling or tugging hair apart. Then brushing should be much easier as you work in smaller sections. Many salon professionals use this brush for in-salon moisture treatments as well as detangling and styling hair and clients love the easy-to-use features which makes gorgeous hair easier than ever. I personally suggest using our Prep spray which is a lightweight leave in conditioner for hair as well as our signature hair serum Shine whether you blow-dry your hair or leave it for a wash-and-wear sort of look.